A flash flood is a rapid increase in flow along a stream channel that may allow the water to overflow channel banks and cause a flood. Typically during monsoon season (July through September) there is very little time between the storm event upstream and the arrival of the flood downstream, often under an hour. 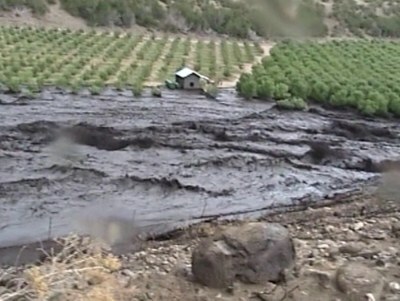 If this flood contains rocks, trees and other debris, it is termed a debris flow. Flood Watch: Flooding is possible. Conditions are favorable for flooding but flooding is not definite. Wildfires dramatically change landscape and ground conditions, which can lead to increased risk of flooding during heavy rains because the burned ground is unable to absorb the falling rain, producing runoff conditions much like a parking lot. Because of this, even modest rainstorms over a burned area can result in flash flooding downstream. These floods are typically much larger for a given sized storm than they were before the wildfire, so flooding is likely to be much more extensive following wildfire, endangering properties previously considered safe from flooding. 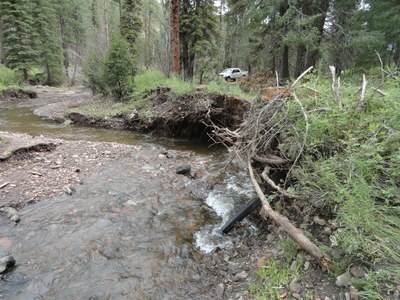 These floodwaters typically transport surface debris such as downed trees, boulders, and gravel. 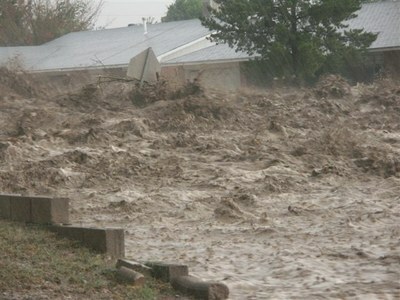 Many areas in New Mexico are at an increased flood risk due to wildfires in recent years. Residents and businesses in areas downstream of a wildfire need to be aware of the hazards they face, the steps they can take to reduce their risk, and resources that may be available to assist them. In New Mexico, the biggest threat from wildfire, both in terms of life-safety and damages, comes from post-fire flooding. 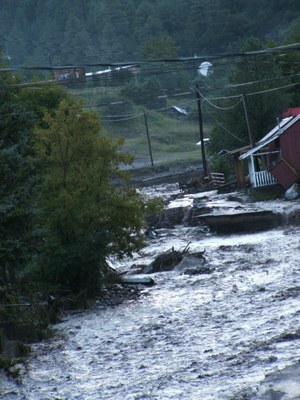 This flooding typically occurs during the summer and early fall associated with thunderstorms that develop during monsoon season. These storms are typically very local, very intense, and of short duration, delivering a lot of rain in a short amount of time. When such storms develop over burned areas, the ground cannot absorb the rain. The precipitation runs off the burned area, and accumulates in streams, producing a flash flood. A top priority for flood preparedness is to purchase flood insurance. To find out more about flood insurance, go to www.floodsmart.gov. For other financial tips related to wildfire, click here. If your property is located in an area in danger of post-fire flooding, remove hazardous materials such as chemicals from your home and outbuildings. You may move the hazardous materials to a location that is not in danger of flooding, or for information on disposal locations, click here, or contact the New Mexico Environment Department. For techniques to help address flood hazard, see our Post Fire Treatments section. For information on funding resources related to flooding, visit our Who Can Help page for community assistance and look for resources provided by the US Army Corps of Engineers. USGS has a new process for predicting debris flows more quickly; they also may install real-time early warning rain gauges for communities affected by wildfire. 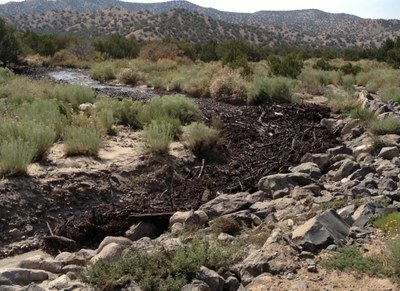 Contact the New Mexico USGS Water Science Center to find out more. 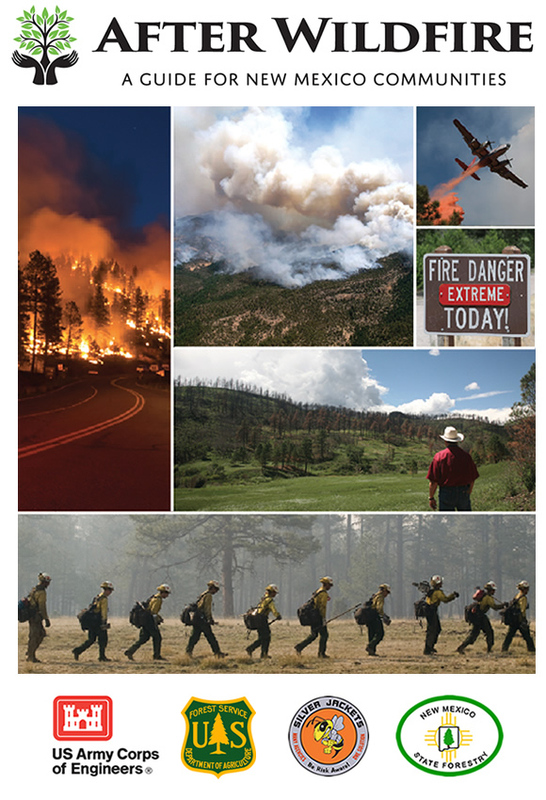 For past USGS studies on debris flow hazards from New Mexico wildfires (Whitewater-Baldy, Las Conchas and Track fires), click here. This includes areas that are most likely to have the greatest debris flows, and may be helpful to areas also anticipating debris flows. Identify the types of hazards that could affect your family. Know your home’s vulnerability to storm surge, flooding, and wind. Locate a safe room or the safest areas in your home for each hazard. In certain circumstances, the safest areas may not be in your home but within your community. Use a NOAA weather radio. Remember to replace its batteries every 6 months, as you do with your smoke detectors. Clothing—seasonal, rain gear, sturdy shoes, etc. Medical records, bank account numbers, Social Security card, etc. Did you know, insurance typically does not cover flooding? Homes and business located in flood areas need to purchase flood insurance to cover damages caused by flooding. Because post-wildfire floods are typically more extensive than before wildfires, individuals and businesses downstream of wildfires need to reassess their flood risk and reevaluate the need for purchase flood insurance even if previously they were outside the flood zone. To find out more about flood insurance, go to www.floodsmart.gov. For other financial tips related to wildfire, click here. FEMA has published almost 100,000 individual Flood Insurance Rate Maps (FIRMs). See your map and learn how to read it so you can make informed decisions about protecting your property, both financially and structurally. After getting flood insurance, there are several things you can do to minimize losses in your home or business and ensure the safety of family and employees. A copy of your insurance policies with your agent’s contact information. An inventory: For insurance purposes, be sure to keep a written and visual (i.e., videotaped or photographed) record of all major items and valuables, even those stored in basements, attics or garages. For more information visit www.knowyourstuff.org. Businesses should have a plan for resuming operations after a flood. Raise electrical components (switches, sockets, circuit breakers, and wiring) at least 12 inches above your homes projected flood elevation. Filling sandbags is a two person job. Have one person crouch or kneel, holding the bag upright on the ground. The second person shovels sand into the bag until the bag is one-half to two-thirds full. Fold the top of the bag over; do not tie bags. Sandbags are generally filled near the location where they will be placed. Place the bag in the desired location such that the open end of the bag is folded under the sand. Bags can be stacked up to three-high a single line or can be stacked in a pyramid shape, with each layer containing one row fewer than the layer below. The pyramid pattern provides more stability, but requires more bags. Alternate the placement of the bags to fill in potential gaps or weak spots. Place sandbags with the folded end of the bag facing the upstream direction from which the water will flowing. This will cause the water to keep the bag sealed, rather than opening the bag and spilling the contents. For more details on sandbagging techniques, click here. Plan and practice a flood evacuation route with your family or employees. Know safe routes from home, work, and school that are on higher ground. Ask an out-of-state relative or friend to be your emergency contact. Itemize and take pictures of possessions and assets. Keep valuable items on the upper floors of your home or building. Do not drive into flooded areas. If floodwaters rise around your car, abandon the car and move to higher ground if you can do so safely. You and the vehicle can be quickly swept away. It can take only a foot or two of water to float or sweep away your vehicle. NOAA Weather Radio: Listen to NOAA Weather Radio for information on flooding and other weather alerts. Be aware of streams, drainage channels, canyons, and other low-lying areas that can flood suddenly. Flash floods can occur in these areas with or without such typical warnings as rain clouds or heavy rain. If it is safe to evacuate, leave your home. Listen to NOAA weather radio, a battery-operated radio, or television for the latest emergency information. Use phones only for emergency calls. Stay away from damaged areas. Return home only when authorities say it is safe. As soon as floodwater levels have dropped, it's time to start the recovery process. Here's what you can do to begin restoring your home. If additional assistance is needed, contact your county Emergency Manager.